The Scott Count Historical Society and El Quartelejo Museum are excited to announce their upcoming programs, Trunk Talks, which will run September 2017 to May 2018. This series of traveling resource trunks through Kansas State Historical Society is created for teachers, youth leaders, museums, libraries, and other Kansans who are looking for a unique and educational way to share the rich heritage of Kansas with others. Each trunk has a specific topic in Kansas and US history with many historical artifacts, primary source documents, and photographs for students and families to have a hands-on and personal experience with the past. Kids, teachers, and caregivers can learn thinking skills, practice asking questions about the past, study history from multiple perspectives, and share knowledge through creative activities. When can you join in the conversation? 1st Wednesdays at 1:30 PM are for Homeschoolers and their Teachers and 2nd Saturdays at 1:30 pm are for Kids, Family and Friends at the El Quartelejo Museum and Jerry Thomas Gallery & Collection! These will include lots of hands on exploration and a field trip or two! Program Director, Stephanie Fisher, will be guiding the activities. 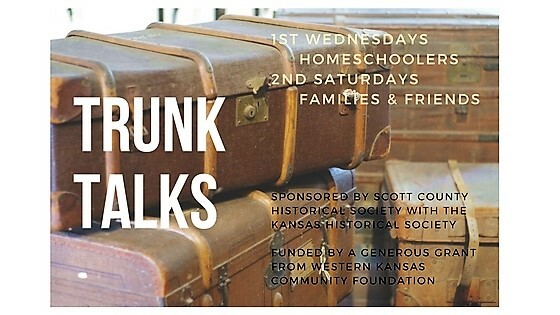 Trunk Talks are sponsored by the Scott County Historical Society in conjunction with the Kansas Historical Society and funded by a generous grant through the Western Kansas Community Foundation. Call Stephanie Fisher at 620-872-5912 for more information AND like our page on FaceBook to get to know us and all our events for you! El Quartelejo Museum & Jerry Thomas Gallery and Collection is located at 902 W. 5th Street in Scott City. Where Fossils meet the Frontier!